In many cases, formulas that use array constants do not require Ctrl+Shift+Enter, even though they are in fact array formulas. 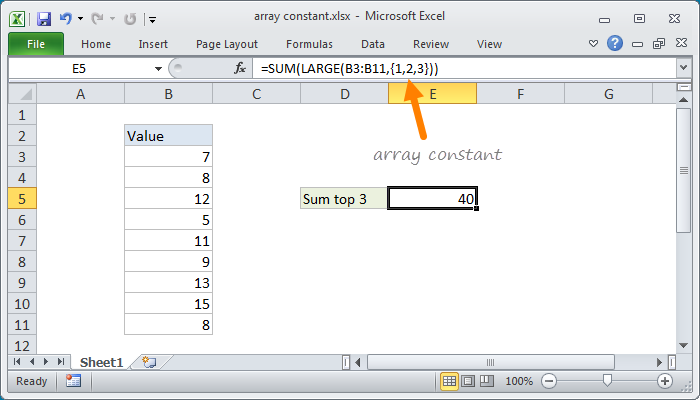 The curly braces surrounding an array constant signify "constant" to Excel's formula parsing engine. As a result, you can't include references or functions in an array constant, since doing so would make an array constant variable (i.e. not a constant). The formula in the screenshot is explained here. Another example of array constants inside the COUNTIFs function.